It’s party time! These addictively crunchy shrimp are perfect for any celebration, especially when you dip them in a spicy-sweet mango sauce. The key to the crunchy coating is in the layers. First, there’s a layer of tapioca starch. This is a perfectly Paleo-friendly thickener: it’s just a ground-up root from the same plant that gives us tapioca pearls. The second layer is a coating of whites, which doesn’t really do much by itself, but makes the final layer of coconut flakes stick. All together, the whole process gives you crispy shrimp with coconut flakes that actually stick to them. 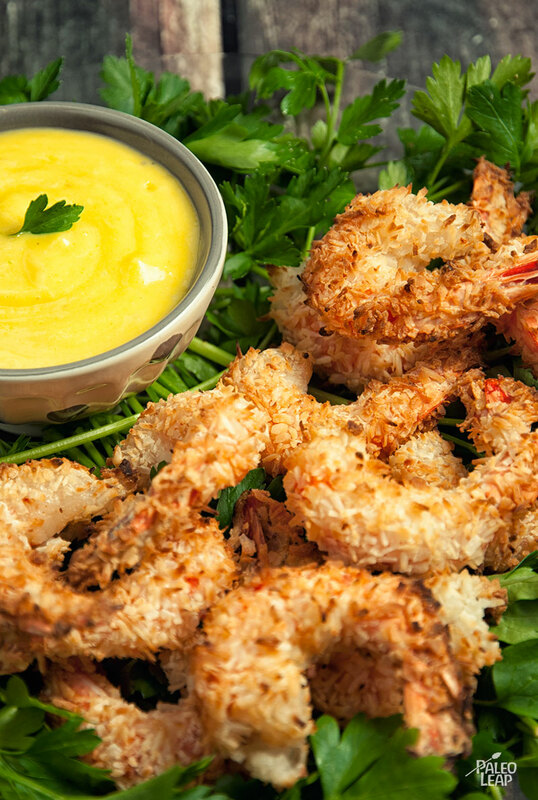 You could always serve crispy shrimp with cocktail sauce (there’s a Paleo-friendly recipe here), but this recipe also includes a sweet mango dipping sauce with just a hint of jalapeno peppers for the spice lovers. Try it as an appetizer plate or party food: it’s sure to be a hit, especially with kids. Line a pan with a wire rack. Add the tapioca starch to a bowl and season to taste with salt and pepper. Place the egg whites in a second bowl, and the shredded coconut in a third. Line all the bowls up on your countertop in order (tapioca starch, egg whites, then coconut). One shrimp at a time, dredge in tapioca starch, then egg whites, then coconut. Place on the wire rack. Once all the coconut-covered shrimp are on the wire rack, place in the oven and bake for 10 minutes on each side (20 minutes total). 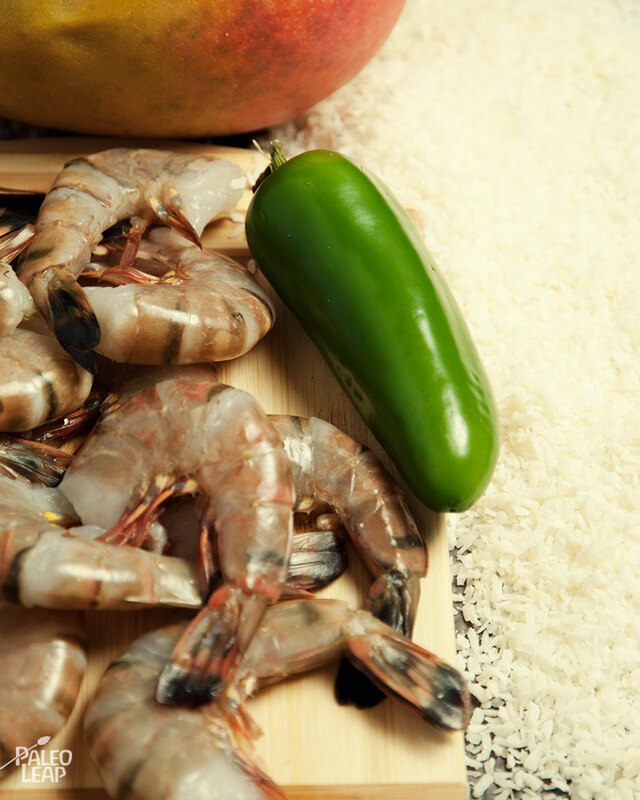 While the shrimp are cooking, combine the mango, lime juice, jalapeño, coconut milk, and honey in a blender. Blend until you get a smooth sauce. Serve the shrimp hot with the mango sauce.